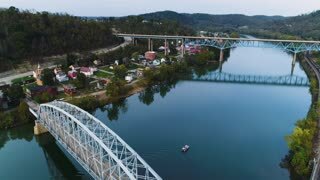 A daytime aerial establishing shot of traffic passing over the Birmingham Bridge over the Monongahela River near Pittsburgh, PA.
PITTSBURGH, PA - Circa April, 2017 - A slowly moving dolly establishing shot of people and traffic passing over the Roberto Clemente Bridge over the Allegheny River. PITTSBURGH, PA - Circa September, 2017 - A high angle aerial profile right to left establishing shot of traffic passing on the Birmingham Bridge over the Monongahela River. PITTSBURGH, PA - Circa September, 2017 - A high angle aerial profile left to right establishing shot of traffic passing on the Birmingham Bridge over the Monongahela River. PITTSBURGH, PA - Circa September, 2017 - A daytime establishing shot of traffic entering and exiting the Birmingham Bridge on Pittsburgh's South Side. 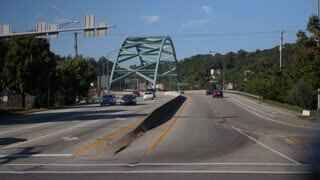 A daytime high angle aerial profile establishing shot of light traffic on the Rt 40 Market Street Bridge over the Monongahela River in Brownsville, PA - a Pittsburgh suburb. 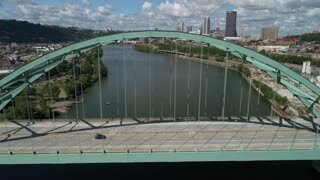 A daytime rising aerial establishing shot of the Market Street (Rt 40) bridge over the Monongahela River in Brownsville, PA - a Pittsburgh suburb. 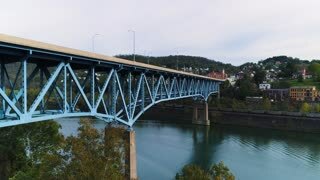 A daytime aerial profile establishing shot of the Rt 40 Market Street Bridge over the Monongahela River in Brownsville, PA - a Pittsburgh suburb. A daytime high angle reverse aerial establishing shot of the small town of Brownsville, PA - a Pittsburgh suburb. Bridges over the Monongahela River in the foreground. A daytime high angle forward aerial establishing shot of the small town of Brownsville, PA - a Pittsburgh suburb. Bridges over the Monongahela River in the foreground. A slow forward aerial establishing shot of pedestrians and traffic on the Smithfield Bridge over the Monongahela River in downtown Pittsburgh, PA on a sunny winter day.